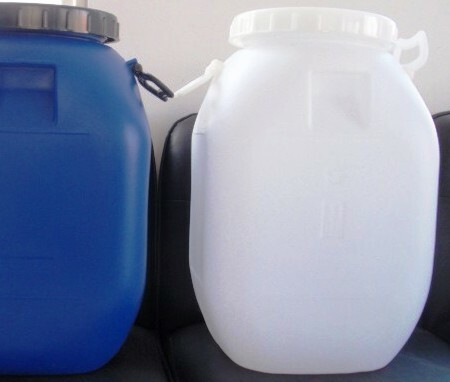 For MSDS SDS of Finogel PPG-700 Preformed Particle Gel for Conformance Control Manufacturers Please write to us. Finogel PPG-700 is a < 1mm-sized Preformed Particle Gel (PPG), developed as a treatment option for injection wells to improve conformance control. A suspension of PPG will swell in the injection water and will, preferentially, block high permeability watered-out channels as to divert injection water into oil-rich zones previously not swept. Finogel PPG-700 suspension can selectively enter reservoir intervals of extremely high permeability and the result is more controllable than a traditional polymer/crosslinked gel system. 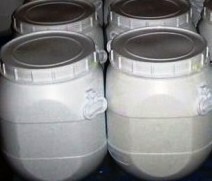 Finogel PPG-700 ia an intermediate strength preformed particle gel, with advantages of viscoelasticity, high blocking efficiency, and good tolerance high temperature and salinity. In addition, the PPG injection/treatment process is operationally simple and cost effective. A small amount of Finogel PPG-700 was added into test brine. The solution was left standing at room temperature for some time and then was observed under microscope or by naked eyes. Results show that PPG particles swelled to a large extent (Figure 1), which suggests a great potential of blocking the fractures and water thief zones to improve the conformance control. Figure 1. PPG particle before and after swell. Finogel treatment was applied in a high temperature, high salinity oilfield. The reservoir had been developed by water flooding and he injection wells were treated with PPG to enhance oil production. The results are shown in Figure 2. Finogel treatment improved injection profile and reduced water cut. It improved oil recovery by 29, 000 incremental barrels in the first 7 months, with net results of 0.65 incremental barrels per pound of PPG. Figure 2. 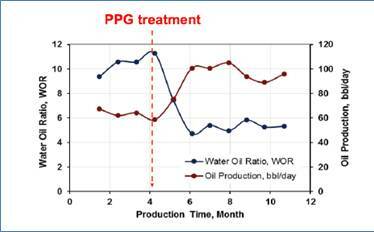 Injection well treatment reduced water cut and increased the production rate. 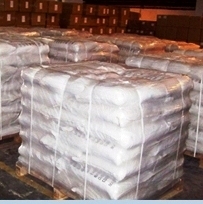 Packaging: Finogel is available in 55 pound bags and 2200 pound Super-sacks. Storage: Finogel can be stored for 24 months under recommended dry conditions (40 - 95°F), away from direct sunlight.